From master baths to powder rooms, these next-level lighting ideas are sure to inspire your project. Bathrooms are pretty simple as far as accessories go, and that’s why lighting is so important—it really stands out. And choosing a set of sconces from a sea of options is no easy feat. A traditional bathroom will look off with a globe sconce; an Art Deco space isn’t craving an opulent crystal design. It’s all about getting your pairings right. This guide will give you a better understanding of what styles will—and will not—work for your space. This bathroom featured on the Ace of Space embraces the Art Deco vibe—even down to the hair accessories. If you stick to one style for your space, it makes your choices easier because you are a bit more limited. Start with your space’s concept, and everything will fall into place. It may sound like common sense, but don’t overcomplicate things. If your space features simple elements—like this one on Bright Green Door, embrace it. There is no need to fuss up the space. Simple white subway tiles and streamlined nickel fixtures are practically begging for understated ceiling pendants. This renovated bathroom is all about brushed brass fixtures. They are seriously stunning and create a uniform story for this space. You notice this touch in the bath faucet, towel bar, and sink accessories. It even makes an appearance in the sconces, which are absolutely perfect in this bathroom. It says a lot about a space when you notice the sconces as much as the powerful pink wallpaper in this studio featured on Design Sponge. The wallpaper makes a statement, but the lights sure do shine. 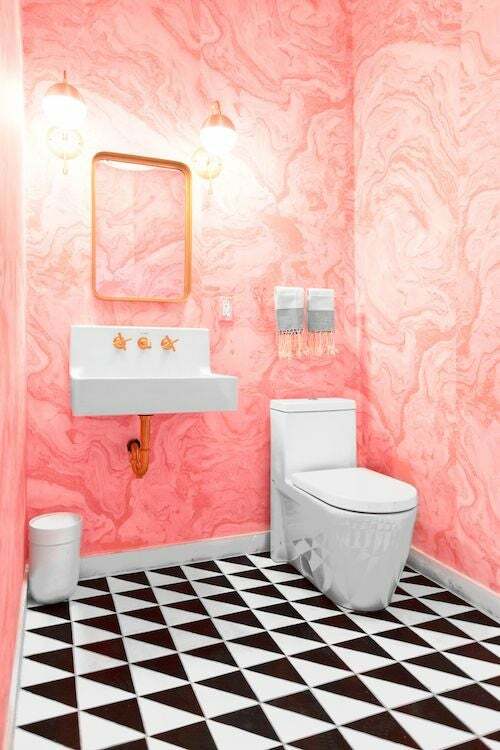 This bathroom embodies a tight palette: white, black, brass, and blush. This allows for the other features to stand out without competing. When attempting a farmhouse look, you have to make sure your sconces fit—and these do the trick. They aren’t in-your-face farmhouse, but neither is this bathroom. The sconces over this mirror are special without being too much. They have a unique style without detracting from the stunning blue beauty that is this bathroom’s vanity. This bathroom created by emily henderson has nautical touches in spades, and the orb lights fit into the theme nicely. They are buoyant sconces that further lift up this already optimistic room. Located in Seattle’s Palladian hotel, this is one of the sleekest bathrooms we have ever seen. The attention to detail here is impeccable. The shiny brass tones bounce throughout the space—even onto the sconce, which features a milk glass globe. Sconces don’t always need to be the start of the room. In this Cortney Bishop-designed bathroom, the vanity is what catches your eye first. Next, it goes to the floor tile. The simple white sconces blend nicely into the wall for a subtly chic result. Glamorous wallpaper needs an equally glamorous set of sconces. These brass buddies are the perfect complement. They crawl up the wall in an effortless way, leading your eye upward. This bathroom by Casework is beautiful, but there’s a lot happening. The tiled wall houses a large, blue double vanity and a great set of mirrors. And the featured sconces balance that lower weight out quite nicely.